A style both romantic and glamorous, this tulle and sequin bridesmaid gown is the perfect addition to any wedding. Available in a variety of shades, it could be the sweetest addition to any bridal party from garden chic to evening glamour. The sequin under layer features a feminine sweetheart neckline that frames the face and highlights the waist before stopping at the knee. A tulle outer layer comes up into a trendy high neckline and flares out at the hips, adding a flirty touch. 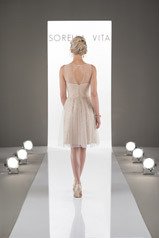 The back of this gown features a sweet keyhole detail. Available in floor length as Style 8869 and in a corresponding juniors style, Style J4015.